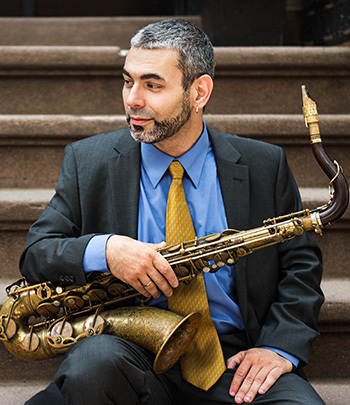 A native of São Paulo, Brazil, Dr. Felipe Salles is an Associate Professor at of Jazz and African-American Music Studies at the University of Massachusetts Amherst since 2010. An active musician in the US since 1995, he has worked and recorded with prominent jazz artists, including Randy Brecker, David Liebman, Lionel Loueke, Jerry Bergonzi, Chico Pinheiro, Jovino Santos Neto, Oscar Stagnaro, Duduka Da Fonseca, Maucha Adnet, Tony Lujan, Luciana Souza, and Bob Moses. He has toured extensively in Europe, North and South Americas, India and Australia, as a sideman and as a leader of his own group. Felipe Salles has had arrangements and compositions performed by The Metropole Orchestra, Cayuga Chamber Orchestra, Helsinki Philharmonic Violas, Meta4 String Quartet, Manhattan School of Music Jazz Orchestra, Manhattan School of Music Jazz Philharmonic Orchestra, New England Conservatory Jazz Orchestra, and New England Conservatory Wind Ensemble, among others. His sixth album, Ugandan Suite (Tapestry, 2014), has been described by jazz guitarist extraordinaire Lionel Loueke as follows: “This is one of the best progressive works I have heard in a long time. What a great blend of classical, African and Jazz music.” Both CDs made to DownBeat’s best albums of the year list in 2013 and again in 2014. Dr. Salles is a D’Addario Woodwinds Select Reeds Artist/Clinician and an Andreas Eastman Saxophones Artist/Clinician. He currently leads both The Felipe Salles Group, and The Felipe Salles’ Interconnections Ensemble (18-pieces), and works as a member of the New World Jazz Composers Octet, Kyle Saulnier's Awakening Orchestra, Alex Alvear's Mango Blue and Gonzalo Grau's (Grammy Nominated) La Clave Secreta.